Beach House on Hewitt - Salt Rock Accommodation. You have arrived at your private, spacious and relaxing holiday home on the beach! Our relaxed and spacious house is situated on the beach. A garden gate takes you straight onto a great swimming beach, with a short walk to safe rock pools, tidal pools and the Salt Rock main beach. The main house has 4 bedrooms and 4 bathrooms, sleeping 8, and the outside cottage is self contained, sleeping 2. In total sleeps 10. House (8 people) and cottage (2 people) can be rented on their own on request. There is a swimming pool, table tennis table, TV and DVD player, with a whole library of dvd’s for kids and adults. 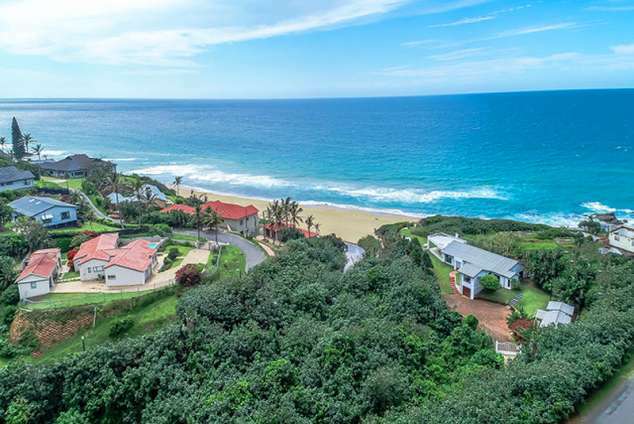 The house is walking distance from a few local restaurants and a short drive to more restaurants and shops, and 10 minutes from Ballito’s offering of shopping and entertainment. The airport is 20 min away and Uber operates in the area. Washing machine, dishwasher, braai, private pool, security alarm linked to armed response, direct beach access, TV, dvd’s and DVD player, private parking, microwave, additional deep freeze, fishing ski, surf ski available, swimming and bath towels. 2276 page views since 27 Nov, 2018.